Here we are once again. This week we embrace and welcome the start of a brand new year. Wherever you were during the weekend, no doubt we all had a chance to reflect and bid farewell to 2016 just before the stroke of midnight on Saturday when we greeted the arrival of 2017. And so here we are today extremely grateful for so many things – especially the gift of life. We give thanks for the past, the present and we pray for the future because we simply don’t know what is up ahead. In times like this, we’ve found that one of the most wonderful things about life is the opportunity to start afresh. And I guess this is the best part about a new year. It’s the chance to start afresh, turn a new leaf and have another go. Today many of us are returning to work. It’s hard, we know. But let’s begin the year on a positive. Let’s think and be inspired by hope. We need to because without hope in this day and age where there is sorrow and suffering everywhere, there is nothing to cling to. There is no doubt that 2016 was an eventful year. All you have to do is read through the achievements of people whose work were highlighted in your Sunday Samoan to know that it was a great year. But wherever there is good, there is always evil. 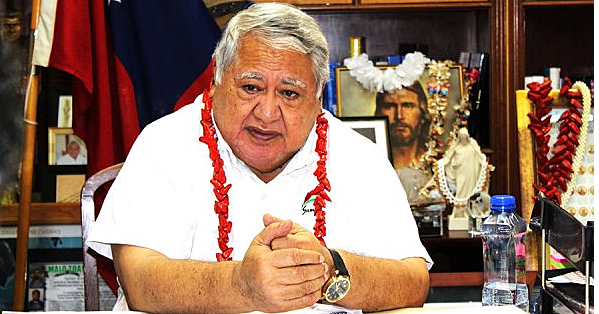 Here in Samoa, the stench emanating from the government, the Church and villages’ failure to address some of the more pressing issues confronting this country is hard to accept. We’re talking about rising social problems and inability to address incidents of corruption and abuse that are hurting the most vulnerable people in our community. When it comes to the government, another year has disappeared without a single thing being done to address incidents of corruption highlighted by the Controller and Chief Auditor as well as the Officers of Parliament Committee (O.P.C) reports to Parliament. Transparency? Accountability? Good governance? We think not. Inside the church, there is reason to believe that some shepherds are doing more harm to the flock, leaving them in sorrow and suffering. Love? Care? Tender mercies? I wonder. As for the villages, we believe the matai system can offer a lot more to help the government and the churches address the problems of today. It involves using the immense power they have to influence young people positively. It also involves them leading by example by doing what is right. It involves them leading with love and compassion and not just meting out cruel punishments for the sake of a few cans of mackerel. We’ve said this before and we will say it again. The bottom line when we stop to reassess and refocus is that we will find everyone has a role to play. Yes the government has a responsibility. It must do its best to make sure that laws and systems put in place to ensure there is fairness all around are respected. These laws and systems are vital so that the less able among us are given their fair share in life. As for today, we are thankful, extremely grateful for the simple gifts of life. We remain forever thankful that we enjoy such a peaceful country despite all the challenges. We must never take peace and freedom for granted. We should treasure them; value them as if our lives depended on it. And as we look ahead, there is reason to be optimistic. Yes we see a glimmer of hope. Even if it’s just a small flicker, we believe that a little light is better than no light at all. So let’s not give up. Let’s continue to take things one step at a time and believe for the best. While at it, let’s also not forget to pat ourselves on the back. While we are not exactly where we want to be, we are also not where we used to be. Indeed all the negative experiences have taught us a thing or two about getting better each time. Today, let us once again remind our leaders in government, churches and in the villages that they are occupying those positions for a reason. That reason is not to protect wrongdoing but to uncover the truth, bring about justice so that the blessings from God for Samoa are equally shared among all. And since many of them love claiming that they have been put in their positions by God, let them also be reminded that it is God who gives authority, he also removes authority. And he is a God of justice. Have a great start to the working year Samoa, God bless!